Check out New Bern Now’s Ledger Magazine (April – June 2019) online edition! It will hit the streets soon! The Interactive Edition is available now, view it here. 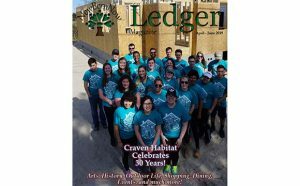 The cover story is about Craven Habitat Celebrating 30 Years Strong! Read other feature articles as well as our regular stories to include Arts, History, Outdoor Adventures, Indoor Recreation, Shopping, Dining, Calendar of Events, Community Notes, and much more! If you haven’t seen the Ledger, it’s a full size (8 1/2 x 11) magazine with 20 pages and we plan on expanding it in the new year! It’s a community effort as our advertisers and supporters believe in our passion to promote the Greater New Bern area. Special thanks to everyone who has contributed to the Ledger! We consider it “The People’s Magazine” as a lot of the information comes from people who live here. We really appreciate our advertisers and sponsors as we couldn’t publish the print edition without your support! The Ledger magazine’s print edition will hit the streets soon at your favorite businesses and non-profits in and around town to include: Downtown, Around Town, and surrounding areas! Let us know if you would like to be a distribution place or give us a call to find out where you can get your copy. Please feel free to share your thoughts and feedback with us, as it’s not about us, it’s about improving our community at large! We strongly believe that if we don’t learn something every day, we’re not living”! Tell us what you think by sending us an email or calling 252-259-6853.